I’ve heard a rising refrain lately about “ALL Muslims” this or that. I’m tempted to respond with two words the next time I hear it: Westboro Baptist. Any time someone says ALL Muslims are the same, Christians should understand that’s like saying we are ALL like the members of Westboro Baptist Church. 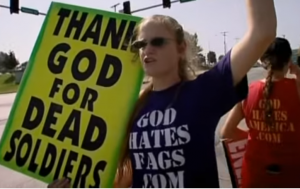 Westboro Baptist members picket at the funerals of soldiers killed in the line of duty and other places they think they might get on TV. Westboro was most recently in the news for announcing plans to protest at the funerals for the victims in the Pulse massacre in Orlando. The scariest, most upsetting, most jaw-dropping fact about Westboro Baptist is this: they actually believe they are spreading God’s truth. Someone recently asked on Facebook why “The Baptist Church” hasn’t revoked WBC’s credentials. This seemed like a great question to me, until I realized there isn’t a governing body empowered to issue, or revoke, credentials in the Primitive Baptist Church. The PBC is separate from both the American Baptist Church and the Southern Baptist Convention. You can read more about the Primitive Baptist Church here and here. In the meantime, here’s my two sentence summary: In the early 19th century, some Baptist churches began to introduce Missionary Societies, Sunday School programs, and Seminaries. The churches rejecting these reforms chose to be known as “Primitive” or “Old School” Baptists. Having now read a lot of material published by various Primitive Baptist churches, I don’t think Westboro Baptist necessarily exemplifies every church in their connection? Denomination? Association? Coalition? Club? Group? But if the other Primitive Baptists wanted to dissociate themselves from WBC, they would have the same problem the rest of Christianity has: they claim to be part of us. WBC does not exemplify, or even represent, Christianity. Yet, when ALL Christians are lumped together, we are associated with WBC and its hatred. Is it possible this is happening to Muslims, too? They picket often, carrying signs saying God Is Your Enemy, Gays Eat Poop, Thank God for 9/11, God Hates Jews, and God Hates YOU. As one former church spokesperson, Megan Phelps-Roper, now says, they “have a view of humanity, most of it is worthless, entirely worthless and deserving of destruction.” This is not only sad, it makes a mockery of Jesus. Why would God seek relationship with humanity if most of us are worthless? But WBC’s actions aren’t about repentance, they are about unapologetic bigotry and hatred, two things antithetical to God. WBC criticizes funerals as opportunities for “worshipping the dead.” WBC members say they are God’s “evil angels,” not because they see themselves as evil, but because they are informing people God has evil in store for America. To them, God is a terrorist who hates everyone. Well, almost everyone. As with most hate groups, they have selected themselves as the elect group with whom God is pleased. I guess sometimes it is. I know I don’t want to be lumped together with Christians who spew hatred and condone evil. That’s enough to make me wonder, is there a Muslim woman somewhere in the world today thinking the same thing about ISIL and the terrorists who have hijacked her religion? What do you think? Are ALL Muslims evil? 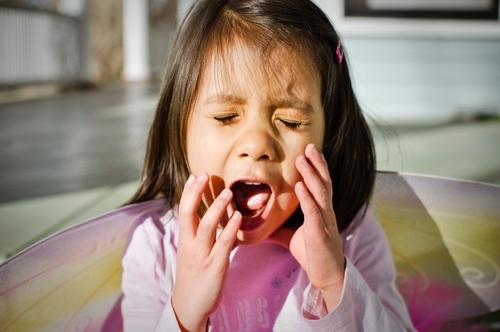 How do you dissociate yourself from Christian hatred? How do you reconcile “church” and “hate group”? Do you think God Loves Everyone is the Greatest Lie Ever Told? Tell me about it in the comments, in an e-mail, or on Facebook.